Everyone has been there, fighting it out at the pin end of the line only to be shot out the back. The starting line can be both the most frustrating element of sail boat racing, but it can also be the most rewarding. There are a few strategies to minimize risk and get off the line clean almost every time. Having good starts will lead to consistent results, which over the course of a regatta will put you close to the top. Here are four quick tips to a great start. Having a prestart routine is critical to getting good, consistent starts. Some things to keep in mind while going through your routine is: wind angle, starboard angle, port angle, and what is coming down the course. This will give you an idea of what phase the breeze is in, and what the breeze could do just after the start. Always try and align yourself on the starting line with the first shift, this will almost guarantee you’ll be in the front off the line. It is common that one side of the line is more favored than the other. Knowing which end is favored is critical but it does not necessarily mean that you should start first boat at that end. A lot of sailing is crowd control, so if the pin is super crowded start just to weather of the group and try and lead the pack to the right. If the boat end of the line is favored, starting just to leeward of the group and lead the pack to the first lefty. These are low risk tactical moves that will get you off the starting line and in the mix. When I first started sailing in college, I would always have a goal of getting to the weather mark in the top 7. What I learned was that in order to achieve that goal you had to start in the middle of the line. By starting in the middle, it gives you the flexibility to hit the first shift while also leading the pack to the next one. Another advantage to starting in the middle of the line is that typically there are no congested packs. 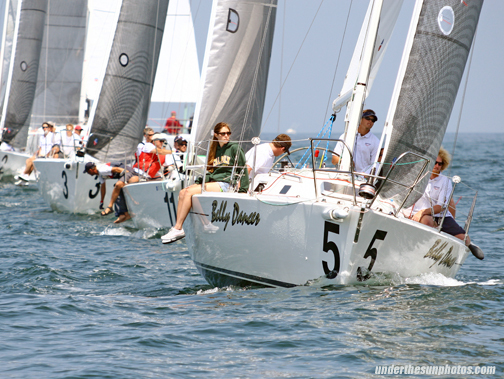 Sailors typically feel more comfortable starting at the ends of the starting line because they are close, or can see where the line might be. This leads me to my next point of finding the line. In today’s racing culture boats typically use electronics to find the line. The most popular device is the Velocitek, where you can “ping” both ends and then you can sail below it and see exactly the distance between your boat and the starting line. But there is something to be said for “finding the flag”. At around three minutes to the gun I like to sail up to the line and visually see where the flag and the pin are. I try and find the line in the general vicinity of where I am planning on starting. This way I can get a feel for what angle I am looking at both ends of the line. This will also allow me to check and see how accurate my pings are. Lastly, as the sequence is getting down to the final seconds, I will check the distance on the instruments and then look and try and find both ends to verify that it is in fact time to go full speed. All of these steps will ensure you hit the line, at go, at full speed. The best starters in the world know when things are not going according to plan. Maybe somebody took your hole, or you aren’t going to fetch the pin but you try anyway. Enough of that, make it easy on yourself. 30 seconds is plenty of time to bail out of your spot and find a new hole, or, as I call it, exit stage right. That means you start on port and duck the last boat that started at the boat, and head to the right hand side of the course. Boats that generally try and force a good start will end up in a spot where they aren’t in the front pack, and subsequently don’t have many options to tack on the first shift. In short, have a game plan, minimize risk by starting in the middle of the line, find the line as you are approaching go, and if things aren’t going well, don’t be afraid to exit to the right.